The battle continues in Penguins vs Possums #6 with both sides preparing for war. 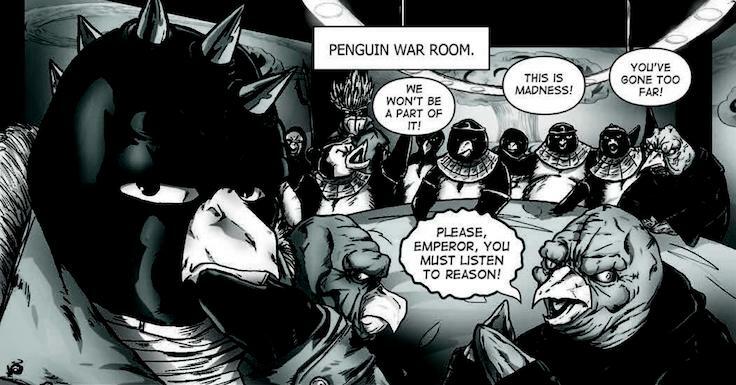 The penguins want to secure their victory once and for all as they prepare to make an attack that may even threaten humanity itself. Will Felicia and C.J. be able to expose this unknown war in an attempt to save humanity from its doom? Felicia has a plan but so do the penguins and they plan on catching everybody off guard. There seems to be some infighting in both camps as the Possums seem to be wasting their efforts on menial tasks much to the disgust of Amaru. 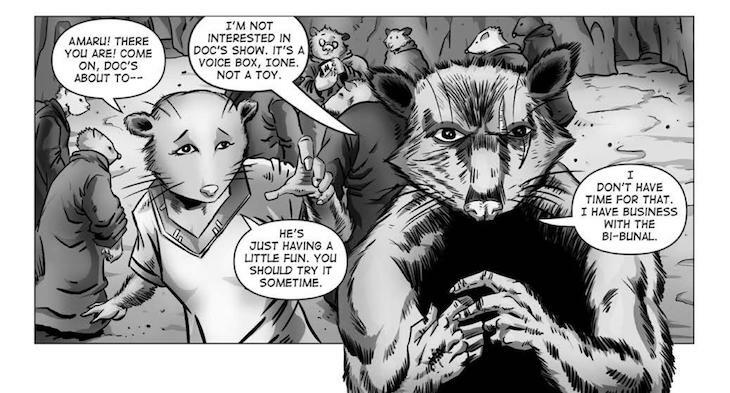 Betrayed by the Bi-Bunal Amaru loses his position as leader of the Possums in the blink of an eye. Xiao is also dealing with some “treason” of his own; the elders seem to be against his leadership claiming that Xiao has lost his mind. Both camps seem to have their problems but in an attempt to make an impact it is the penguins that go on the offensive. Archaeologists Felicia and C.J. have a plan of their own as they attempt to make contact with the US Military in order to warn them of the secret war taking place under their noses. Prepare for an issue that picks up the pace and gives the reader the unexpected! The art is good, crisp and the detail does not distract the reader at all. Even though it is in black and white and filled with detailed pencilling the reader is still able to identify facial expressions and emotions with ease. Even on the possum and penguin faces! The action scenes are also highly detailed and the pace of the scenes makes each action sequence feel intense. What is also noticeable is the fact that they do not spam generic possums and penguins when the parties clash. Each Penguin and possum seem to have a detail that makes them look different. Yet another fun read from Fanboy comics. It is amazing to see the amount of thought that the creators have put into this title. The script is great and one would not expect this of a book dedicated to a war between two different animal species.